Bay Area Kiteboarding • View topic - A Hand for First Alameda Launch? A Hand for First Alameda Launch? I've had about 8-10 hours of instruction, got my first kite set and now looking to take the next step. Still, heading out to Alameda by myself sounds pretty daunting. Are there any kind (and patient) souls out there who would be willing to provide a hand for my first launch? I can promise cold beer(s) and probably a couple unintentional laughs. Re: A Hand for First Alameda Launch? Alameda is a super-friendly place, and one of the top 3 locations in the US to learn to kite (Hatteras NC, South Padre Island TX). 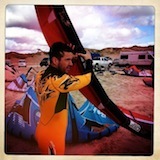 For that reason, there is always a number of other new kiters, instructors, and friendly veterans (Tim!) that can help you launch and land. I would keep an eye on the webcam - once you see kites being pumped up on the cam, you can head down to the beach. You don't need to rush, given that you are going to be most comfortable and successful once there is a good crowd (good wind!). If there are a number of kites pumped but no one is flying them - then there is not enough wind for you to learn on. Same goes with the opposite. If you have a 12m, and everyone else is on 9m and 7m, then you have too large a kite for those conditions. As you get better, you should get a second kite that is 2-3m smaller than whatever is your 'large' kite. (For Alameda, that's a 12m for most guys, 10m for most gals). YMMV. Thanks Andy, great advice. Will keep an eye on the webcam and get out there soon! really good advice from andy, however, alameda is gonna get less and less windy in july and august, so you might want to look into an assisted downwinder at Sherman or in the bay with "captain john" (look for "kite the bay" online).